Backed by a diligent team of professionals, we have been able to manufacture and supply a wide range of quality assured Bell Crank Bush L/L. Manufactured using high grade raw material and cutting edge technology, these crank bushes are highly appreciated among the client. Further, our quality controllers test our entire gamut against various quality parameters before final delivery at client's end. Further, we offer these bushes at market leading prices. 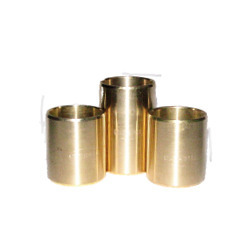 Established in the year 1963, at Mumbai (Maharashtra, India), we, “Matchwell Engg Works”, are revered Wholesaler and service provider of Spring Bushes, Bell Crank Bushes, King Pin Bushes, Tested Bronze, etc. Bestowed with the features like sturdy construction, precision engineering, superior quality, reliable performance, efficient output and high durability, our offered products have gained huge appreciation by clients. These products are widely used in industrial as well as for residential applications. We are offering these products in varied specifications and sizes to cater to the varied needs of our valued clients. We export our products in Indian Subcontinent, East Asia, Middle East & South East Asia.